Fast food culture has spread from its home in North America into the nearby South American countries steadily, and in recent years, the big burger chains have reported strong growth in Latin America. Even so, some of the traditional Latin American street food is much more exciting and unusual than standard fast food chain fare, so if you’re travelling through South America, try something a little different! Street snacks are abundant in Argentina, and one of the first you’re likely to come across is the lomito, a steak sandwich. Like most places, Argentina has its own version of a hot dog, called a choripan, and these are made with spicy chorizo sausage. For a sit down snack, try tostado, which is a simple toasted cheese and ham sandwich, or the native Barrolucas - the beef and cheese version, very popular in Argentina. If you fancy a snack pie, ask for an Empanada and you’ll get a small meat or cheese based pie – although in the run up to Easter you can try special varieties of empanada filled with tuna or cod. The food in Chile shares some background with Argentina and many other countries in South America, but there are a few tempting treats that Chile likes to call its own. Empanada de Pino for example, which is a pastry, filled with diced meat, onions, olive, raisins and a piece of hard-boiled egg, Empanada de Queso is the cheesey version. For meat lovers, there’s also Parrillada – a selection of different meats, sausages and grilled over charcoal and served with potato salad and rice. Columbia has a few national culinary treasures, one of these being the Bandeja Paisa. It’s hard to call this a fast food, although it’s served as a snack and involves a lot of food to choose from, so it’s probably more like an appetiser than a fast food meal in itself. The dish usually includes grilled steak, fried pork rind, chorizo sausages, rice, beans, fried egg, avocado and banana chips.If you’re not quite that hungry, Bunuelos are another popular option. These delicacies are ball shaped cheesey fritters fried until golden brown. 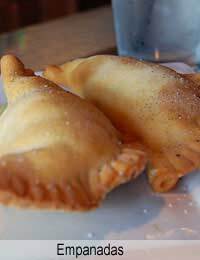 Columbians are also fans of the Empanadas, and in addition to the meat and cheese fillings they like to use rice and coriander. They also bake their Empanadas instead of frying them. Something a little bit different is a Patacone – a green plantain which is squashed down to make pancakes that are deep fried in vegetable oil. The major towns and cities in Peru have no shortage of fast food on offer if you’re hungry while on your travels. Traditional snacks include salchipapas (fries with sliced sausage served with your choice of sauces), anticuchos (a kebab of marinated lamb or beef heart – anticucho de corazon) and empanadas. Snacks and sweets are sold on the streets until late at night all over Peru, and if you have a sweet tooth look out for desserts made with manjar blanco (sweetened condensed milk) or fresh fruit. The most popular street fast foods in Venezuela are Arepas, which are round, flat buns made with corn dough. You’ll find these on offer with many different fillings, a little like a sandwich. There are a range of Empanadas here too, and along with the standard cheese, chicken, and meat versions, Venezuela also offers the option of shark meat, and mixed beans. These are especially popular on beaches – although the sharks might want to stay out of the way!